If whenever wool touches your skin you develop a bumpy, itchy rash resembling hives or eczema, that could be allergic dermatitis. If you’re near wool and your nose starts to drip and itch, that may be allergic rhinitis. If you develop pink, itchy, puffy eye irritation after each exposure to wool, that may be an allergic reaction in the form of conjunctivitis. you take off your wool clothing to find hives and sores (that weren’t there before you put on the clothing). If you think you are allergic to wool, you might want to visit your physician and have a skin prick test. You may find you’re allergic to things you would never have suspected! What about the itching? Ahhh, that’s coming in Part II. This entry was posted in Crocheting, Fibers, Knitting, Miscellany. Bookmark the permalink. Remember there are different kinds of silk, processing, spinning, dyes etc. Any affects the silk’s feel. I haven’t tried silk yet, I’ve been trying to find a friend who has some so I can take it for a test run, but I’ve had some silk that felt itchy instead of smooth. This post is amazing. I’ve never been able to put into (understandable) words how most people are not actually allergic to wool. 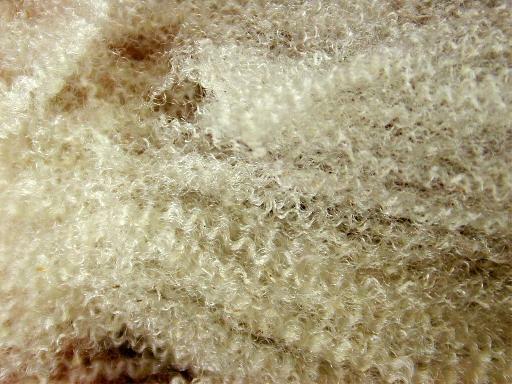 There are factors that make some wool itchy, but most of the wool I’ve worked with has been so soft. Don’t give up on wool! Can you work with silk? My Thor has allergic dermatitis to any sort of protein fiber (I’ve tried them all!) except silk. And, even worse, he has an anaphylactic reaction to angora! So I can’t keep any angora in the house. He generally can wear wool sweaters OVER long-sleeved shirts, but I knit silk/cotton blend linings for any part that touches his skin (i.e., cuffs and neckline) and a full lining for wool hats. Ah, I love you for this. I am so tired of people explaining to me why I couldn’t possibly be allergic to wool, and acting all high and mighty because they know better. I’m 100% sure I am allergic to wool since I am 1. allergic to almost all animals 2. very allergic to farm animals in particular and 3. I said “I am allergic to animals and the fibres” I cannot tell you how many dozens of people look down on me for using primarily acrylic yarns without realizing that I can literally be allergic to wool and I am INTENSELY jealous of anyone who can knit with animal fibres because I hear it’s amazing, but I like having skin on my arms. Using silk I can acid dye to nearly match my wool, cotton comes in such dull colours. But there are some cotton/acrylic blends that are quite nice and have some elasticity to match wool better. When I was a kid I used to say I was allergic to granola bars just because I didn’t like them and didn’t want to eat them. I sometimes wonder if the “allergic to wool” excuse is similar, so then I remind people about cashmere and they get confused. Silk seems to be ok since it’s not a fur/hair type of fiber. She doesn’t have severe anaphalactic (sp?) shock reactions thank goodness. She simply gets an awful rash all over her skin, but that’s miserable enough in its own way. It really annoys her because she actually prefers natural things whenever possible in her life and it inhibits her shopping so much! I’m on the itchy team here – my bet is on the scales because I seem to tolerate superwash better – if it’s of the merino variety. Now that I spin I’m working up designs in my head to knit with silk on the inside of collars etc. to get past the problem. Ahhh, poor thing – she has real allergic reactions like my friend whom I had to take to the hospital?! Not many people are truly allergic, but when they are it seems like it’s REALLY bad. Is she allergic to silk too? I won’t wear synthetics – they feel clammy to me and on some rayons I swear I can smell petrochemicals. So I am anxious for the next part. I must admit that I never make anything wool for myself because I am itching before I get it on good. Do I have a rash? Not sure but the itching is real! I was raised in the SF Bay Area and was never allergic to anything that grew there. But I developed allergic reactions to an array of other plants and pollens when living outside the Bay Area! I would be very suspicious as to the fiber content of “cashmina.” Re the lingering itchiness under the cuffs, knit a pair of cotton wristlets that go past your wrist onto your hand. That should help. Or you could also line the cuff with cotton or fleece. Now that brings back memories! We should make tents out of the old Navy blankets! I always loved their scratchy feeling against my skin. I like that word – the “pricklies.” 🙂 Imagine those foremothers of ours who swam wearing wool swimsuits! I’m with you re wool … my favorite too! Do you find they object less to machine washable wools? In my younger days, we would drag my Daddy’s wool Army blankets everywhere from bed to tree fort outside. The only time I would experience itchiness from it was when, like caityrosey stated, I was sweaty or the blanket was damp (got that way protecting us from rain on Summer days). Wool is supposed to be naturally hypo-allergenic I thought. I reckon, if it makes one itch, that would be an allergic reaction. If it is itchy though, doesn’t mean it’s an allergy to it anymore than fiberglass insulation is itchy. That doesn’t make me itch either but it is itchy…or, again, like caityrosey described as prickly. I had no idea people could have anaphylactic reactions to wool! The handful of people I’ve known with genuine wool allergies get the rashy, dermatitis type. Anaphylaxis is *much* scarier. I sometimes get slightly itchy from wool, but usually only if I have also gotten a little bit sweaty. Something about the moisture brings out the pricklies. I prefer knitting with wool more than anything else. Why put the time into a garment on less than great materials? But my daughters in laws want sweaters for the kids that wash easily and one claims to be allergic to wool. So I compromise. Thank you for setting the record straight! What most people really need is a wool with a low micron count. I used to think I was allergic to wool and still can’t wear it next to my skin but have no problem knitting with it – in fact I love knitting with it more than most other fibers. My skin contact problem is that I develop what looks and feels like a sunburn which goes away fairly quickly but I can wear it with a simple layer of fabric underneath. Years ago I knit a Norwegian sweater (in merino) for my mother but she died of “old age” before I got it done. I have been wearing it quite successfully for the past 10 years, even with a small amount of contact on my wrists. My son brought me a cashmina home from his year in China and I wore that about 5 minutes before I thought I would Die. I have never cared for cashmere – just didn’t like the feel of it next to my skin, rather different than an itch. Weird. One of my dearest friends is allergic to wool and basically all other animal fibers. It really is a shame 😦 She has to be very careful whenever she buys new clothes. Everything she wears is either synthetic or cotton, much to her dismay. She can’t even wear cashmere! This is interesting, and I’m eagerly awaiting part 2. I was told by one doctor, “You’re allergic to everything!” because my blood test showed high histamines. But when I went to an allergist and had all the pin-prick tests, I was allergic to none of the common allergens for this area.